Instruction at 0x00401310 checks if there is a command line argument. There is an irritating sleep function, you could either NOP the function or change the argument to 0. 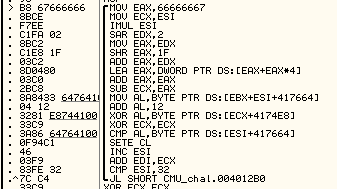 Next there is a reference to 0x417550 and then a Jump to the actual code. On inspecting the memory at 0x417550, a plain text is received (274 bytes) when XOR-ed with 0x55. Next, it checks that the name of the program is princesswarrior.exe, you can just bypass that or rename the executable, then the length of the string is checked, it should be 0x32.